I’m still trying to wrap my head around my epic weekend. This was my first official “runcation” and it did not disappoint! I’ve always wanted to visit Chicago so I figured I could combine my love of running with a mini getaway. 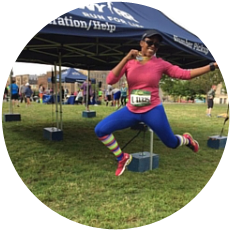 I participated in the Rock ‘n’ Roll Remix Challenge by completing the 5K on Saturday and the half-marathon on Sunday. I also attended an awesome meet-up with some amazing people. This was a jam packed weekend so I’m going to break up the posts into three parts. In this post I’ll discuss the expo! My mom, sister and I arrived in Chicago on Friday morning. After checking into the hotel, we grabbed lunch and headed over to the expo. Because we went as soon as they opened, the expo was not crowded at all. It was nice! Runners could still register for the races on Friday. After entering the expo and picking up our bibs, it was time to pose for my photos (of course)! My sister posing with her bib for the 5K. This was her first official race! After we picked up our bibs and t-shirts, we headed into the main part of the expo. We were immediatley greeted by an amazing selection of Brooks Running clothing and I had to really restrain myself from spending hundreds of dollars on all the amazing apparel. I absolutely LOVE Brooks running clothing because their items are really great quality and fit me well. The only thing I don’t like are the price tags (ouch!) so I’ll have to wait until these items are on sale! After successfully NOT spending any money on clothing, I decided to take advantage or a free gait analysis sponsored by Brooks. I just want to give a huge shout out to Brooks because their ‘Run Happy Island” set-up was so well thought out and so cool! For the gait analysis, we were told to run on the treadmill at a comfortable pace. The Brooks volunteers took video of our strides (from behind) and then shared their analysis with us. I have done a gait analysis before – about 2 years ago – so I wanted to see if it stayed the same. It did – I was told that I need a stability sneaker, which is what I currently run in. Brooks also emailed us three options for sneakers based on the analysis. Fun scenery for the kiddies! to pick up my free item which was a cute Brooks bag! Instead of riding the bull, kids could ride the giant sneaker! Waiting in line for the gait analysis took a bit of time (over 30 minutes) so I was excited to start actually exploring the expo. This was too funny to pass up! Hands down the best part of the expo was meeting Meb!! I waited in line around 2 p.m. to get the chance to meet him. He was the MOST humble man and extremely soft spoken. He agreed to pose for a photo and signed a photo for me as well (we received the photos while waiting in line). It was truly incredible to meet him. Although this expo was smaller than previous expos I have attended, I thought it was great. The expo had really good vendors and I loved visiting the different booths. One thing Rock ‘n’ Roll does well is provide really nice expos! After leaving the expo, we went downtown to get dinner and then headed back to the hotel to get some rest for the 5K race the next day. Check back tomorrow for Part II – The HOT and HUMID 5K race + #WeRunSocial meet-up!